Recessed lighting are also known as downlights. They differ from regular lighting that drops from the ceiling. Recessed lighting is installed within the ceiling and only the shining light can be seen. They appear as a light shining from a hole in the ceiling. These lights vary in size and shape like regular lights. They comprise of two visible parts called the trim and baffles. 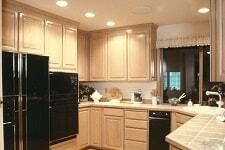 Trim refers to the metal or plastic circle that fits on the ceiling helping to secure it. The baffles are the inner insert that helps to reflect the light. The shape and form of the baffle would determine how the light is reflected. A lot of buildings use recessed lighting instead of other types of lighting. Their installation requires an electrical technician to avoid problems. You can hire an electrician that offers recessed lighting installation near you. These lights are unique and suitable for movie theatres, stores, kitchens in homes, shower stalls, even schools. Unlike other light fixtures, recessed lighting are waterproof. This makes them suitable for a water-intensive environment like shower stalls. When they come in contact with water, they do not go bad or pose a threat. As more houses are built, manufacturers continuously come up with new products or designs. Some light fixtures are recognized as relics of the past because later models replaced them. Recessed lights are different because they are unusual and trend-proof. They do not go out of style and this makes them a good option for commercial buildings. This is a valuable benefit of recessed lights. They make ceilings look neat and organized as the fixtures lay hidden within the ceiling. Other types of lights such as lamps and dropping ceiling lights have exposed fixtures which can be dangerous and give the ceiling a busy appearance. Lights sometimes can reach only a limited space when installed, but with the proper recessed lighting installation near you, the room can become fully illuminated. This is highly beneficial. There are some parts of the home such as basements, with a low ceiling. Regular light will not be suitable for such rooms. Recessed lighting is an ideal option for low ceilings because they occupy less space but illuminate the room as needed. There are DIY methods available for homeowners or property owners to attempt installing recessed lights themselves. However, it is always better to call an experienced electrician from The Electric Connection for your electrical services. Recessed lighting has to be properly installed to ensure they are secured to the ceiling. There is also the matter of insulation. Some recessed lights need to be covered with insulation to prevent the heat given off from starting a fire or other problems. An electrical technician will professionally complete the installation within stipulated electrical codes. This guarantees durability and allows you to seek the opinion of the electrician for the appropriate recessed lights to install. ← What is the Importance of House Rewiring?